Susan Baynard Parton, age 59, of Rutherfordton, died Wednesday, April 19, 2017, at the Hospice House of Rutherford County. She was the daughter of the late Luke and Grace McMahan Baynard. In addition to her parents she was preceded in death by one sister Patti Vess. Susan was a loving and caring mother. She was an active volunteer for Meals on Wheels for many years. 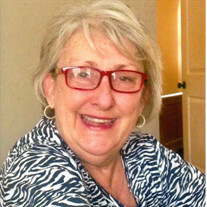 Susan was a native of Rutherford County and a member of First Baptist Church of Rutherfordton. Nephew and caregiver Rob Vess and his wife Jannie The family would like to greatfully thank Willow Ridge Nursing Home and Hospice of Rutherford County for the good care Susan received and for all her friends and church family who supported her. The family will receive friends from 2:00 PM to 3:00 PM, Sunday, April 23, 2017 at McMahan's Funeral Home. The funeral service will be 3:00 PM, Sunday, April 23, 2017 at McMahan's Funeral Home Chapel with Reverend Tim Marsh officiating. Interment will be at Rutherfordton City Cemetery. In lieu of flowers memorials can be made to Hospice of Rutherford County P.O. Box 336 Forest City, NC 28043. The family will be at the home of Rob Vess, 171 John Warren Drive Forest City. McMahan's Funeral Home & Cremation Services in charge of arrangements.